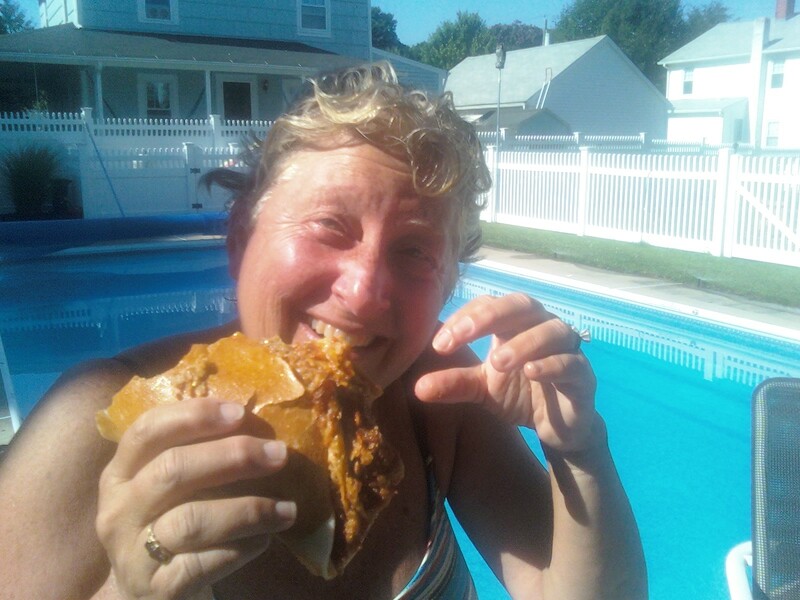 Mom’s Meatballs: Put them in my mouth! My mom is great, plain and simple. She may not be the best cook around, but she does make some really good meatballs…. They were what I would ask for her to make me for special ocassions, like my birthday, and when I would stop by for a rare visit home from college. She uses a pretty simple recipe, which I will get up a little bit later, but the key to the good meatballs is the egg to meat ratio, which is 3 to 4 eggs per lb. Well, I came home for a friends wedding, which was close to my parents house, and sure enough when my mom asked me what I wanted for dinner, my response was “MEATBALLS!! !” So she went to work making them…. I was a very happy person…. I was so excited, my hair was standing straight up! How do you figure out where a good place to get a sandwich is? Do you google it? Do you look for places that have lots of cars in the parking lots? do you look for places that are familiar to you from another location (aka chains)? 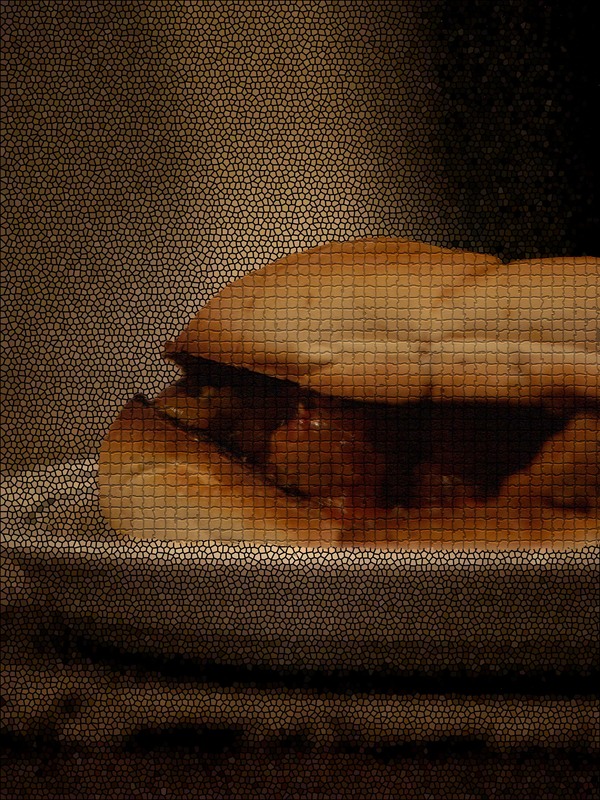 Do you look for places that have pictures of sandwiches on the windows, the signs, or in their names? Do you ask your mother? I prefer a little bit of everything. As i was back home for the holiday I was looking at the little town of Clinton, CT through a new set of eyes…. wide open sandwich hunting eyes. When i thought about sandwiches in the town I spent every summer in, my mind immediately jumped to a place called saldamarco’s. Saldamarco’s has been in Clinton for as long as i can remember. I always used to ride my bike by it on the way to the marina, and then hope it would still be open on my way back from cleaning the boat. They used to have very strange hours, and it seemed like they were never open when I wanted a sandwich. it would seem like they would close at 4 or 6. But the sandwiches were so good that even when you weren’t hungry and you saw that they were open, you would stop and get one for later. They do not have a huge selection of fresh veggies, but they do have a pretty good selection of good meats. 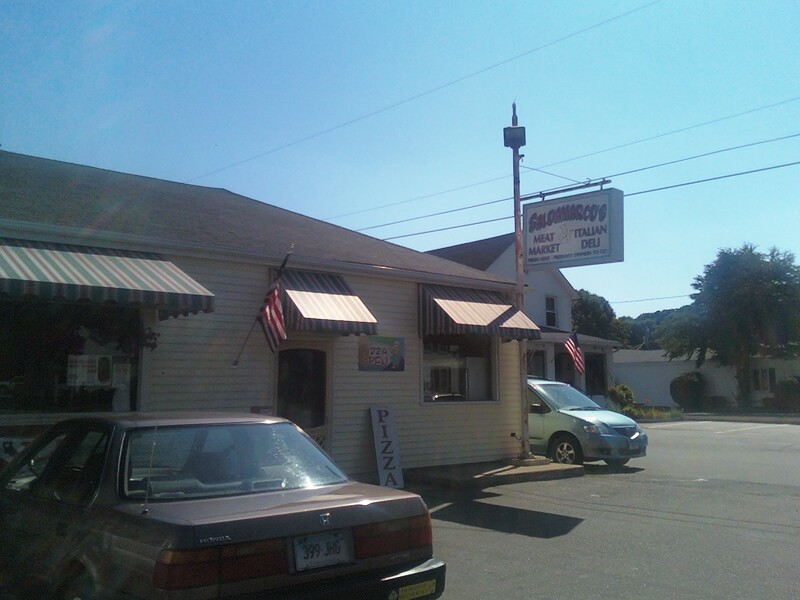 They make their own roast beef and some other meats, and they have stuff that every good italian deli should have. They have pastrami, salami, ham, turkey, eggplant, chicken parm, fresh mozzarella, Capicola, and so much more. They use really good sub rolls that have just enough substance but aren’t too crunchy. They get a little soggy if you go with something with the tomato based sauce and it sits there too long, but the sandwiches smell so good that you never really want to leave them that long. I walked in and was thinking about getting the eggplant parm, but it was so hot out that day, that I wanted something cold. That and my mom was getting the eggplant parm. My stepfather got the Sinatra, which is one of their “specialties”. my mom got the eggplant parm, and i got a roast beef and pastrami with lettuce, tomato, peppers, crushed red pepper flakes, olive oil, spicy mustard and vinegar. 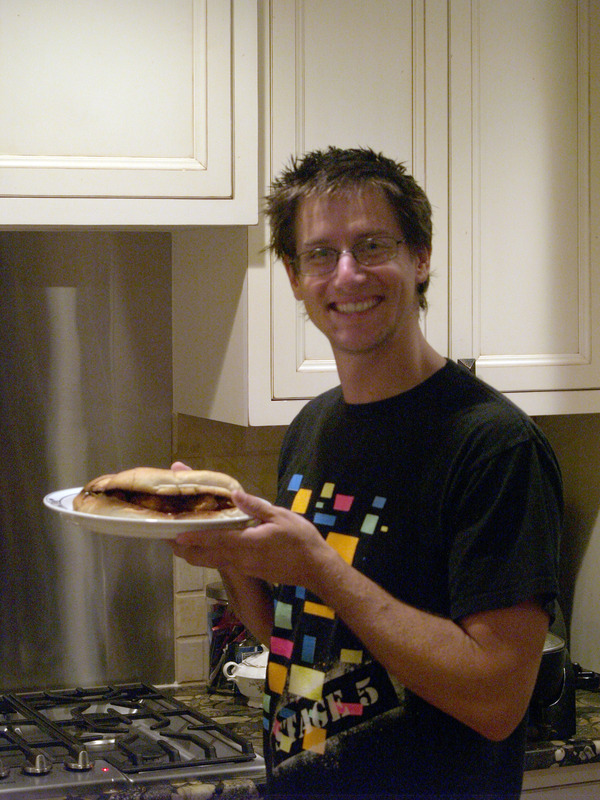 I was pretty happy with my sandwich. The quality meats and bread made for good hearty flavorful bites, even though the pastrami was a little on the tough side. There was a healthy slathering of mustard, and the red pepper flakes were sort of like the fireworks from the night before, popping and bursting occasionally among the bites of pastrami, roast beef, and lettuce. The soft bread soaked up just the right amount of olive oil and mustard, and compressed enough with a squeeze so you could get it in your mouth. 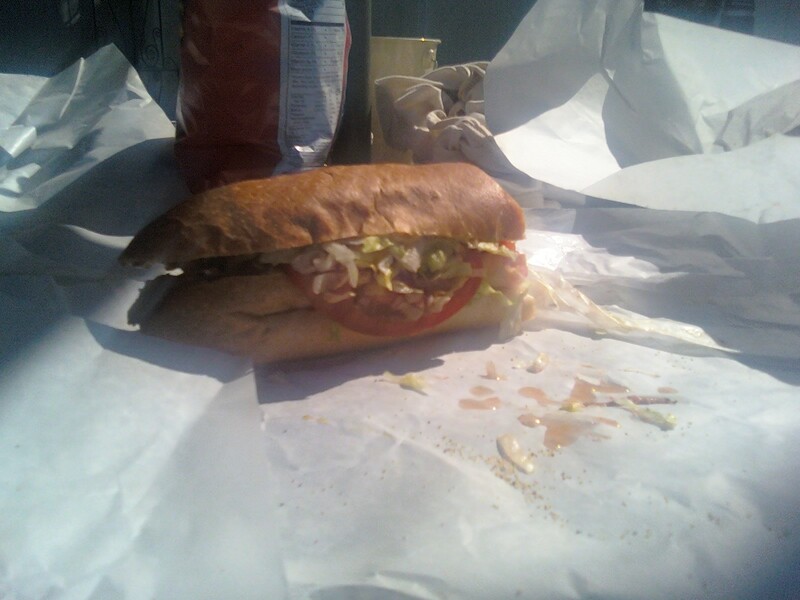 Here was my sandwich, before I ate it…. Now on to my mom’s sandwich. Hers was about 3 good sized pieces of breaded eggplant, with provolone and shredded mozzeralla. It was nice and warm, so the cheese got all melty. It was finally starting to cool off as we were sitting by the pool. 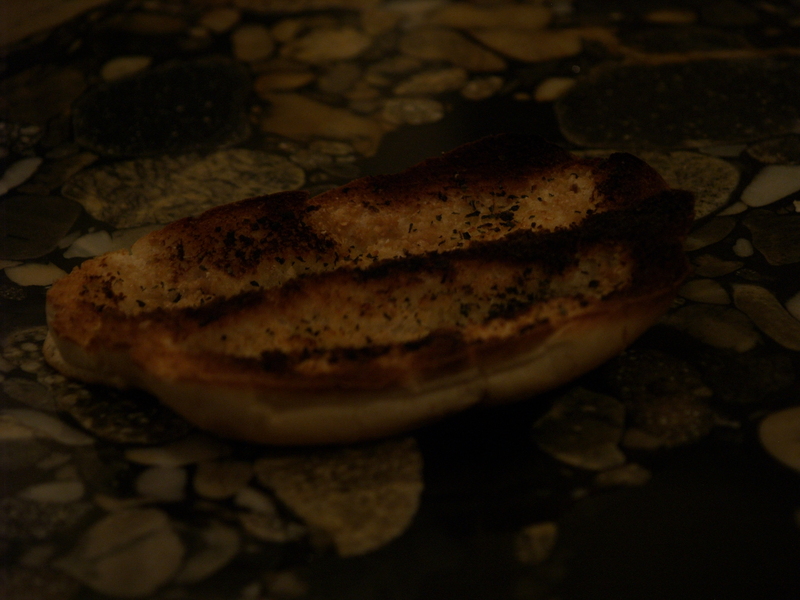 The sauce was starting to seep into the bread just a little bit. My mom was glad I decided to go on a mission to go get Saldamarco’s Sandwiches, because she really does like sandwiches as well… She also really likes making funny faces while eating sandwiches. All in all, my mom and I both give a total of 4 thumbs and 2 smiles for the saldamarco’s sandwiches. A sandwich test: does bread make a difference? So the other day I found these “Thin Buns” in the cabinet. I had no idea where they came from, or what they were doing there, but I decided to do a test. I decided to use the layers and the inside ingredients as a control and use both a traditional bread and these interesting “thin buns” that made me question how much of a difference the bread makes when everything else is the same. Well, what I did was measure out the ingredients and make two sandwiches. It went like this….